The worst charity car wash. 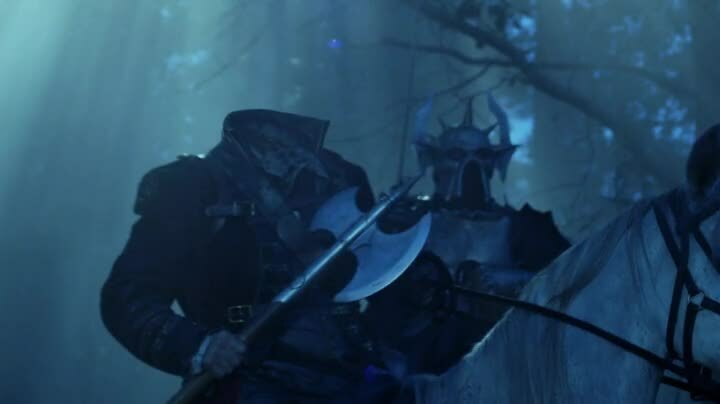 Sleepy Hollow returns with another episode that brings the WTF, while still having a few hokey and cheesy parts. The important thing is the level of good to bad is at least equal to the pilot, and arguably better. We see Sheriff Corbin’s funeral, and find out that Sleepy Hollow has a radio station that plays Sinatra’s Witchcraft at opportune times. But beyond all that, this is the first time we see the snazzy opening credits, which is largely people standing in the dark woods while spooky things happen. 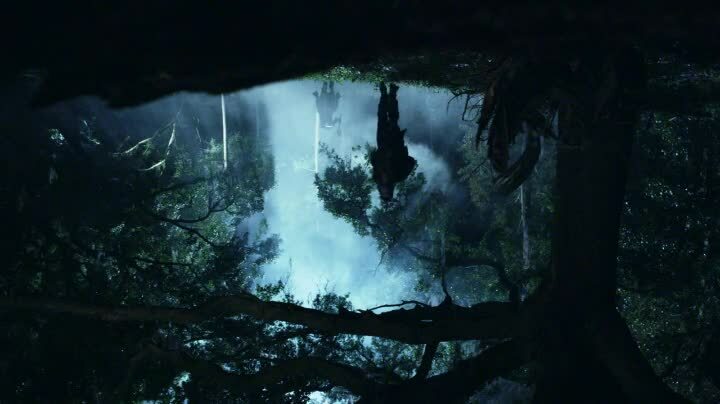 The Headless Horseman barely appears, outside of a dream sequence in the beginning. He rides with the other three Horsemen of the Apocalypse, including a guy with a demonic helmet who is instantly the one rider I care about. Ichabod is dreaming they are after him, then is saved by his wife who gives him a warning about the army of evil people who will do evil stuff to pave the way for the really evil people. Forget the Headless Horseman, I want to know about the Gremlin Darth Vader Horseman! Don’t worry if you missed the pilot and are confused, because Abbie Mills is having a talk with Captain Irving where they basically recap the prior episode, Irving says that everyone has recanted all the crazy stuff except Mills, but he still has her and Ichabod Crane on the case because he has no other choice. We then see an altered video of Andy Dunn, except instead of the Blurry Demon From Legend giving him the Pez head, he does it himself via running into the wall. Also Irving’s got to go to a conference to get more resources or something, and then he disappears for the rest of the episode. Should I make a joke about 7-Up? Naw, I’ll save it for an episode where Orlando Jones actually does something besides be annoyed at Abbie and then do nothing. 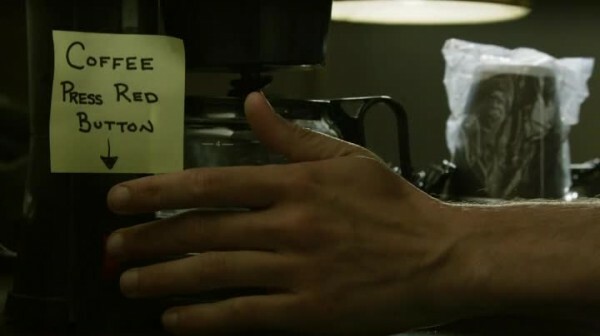 What is clever is Ichabod has post-it notes all over his hotel room explaining what everything does. 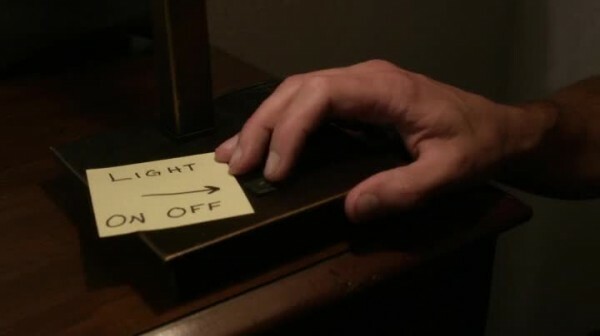 We see him playing with the light switch, fumbling with the shower, even making coffee. He can’t leave his room by himself because he’s still a suspect, thus allowing for a reason he isn’t wandering around town. 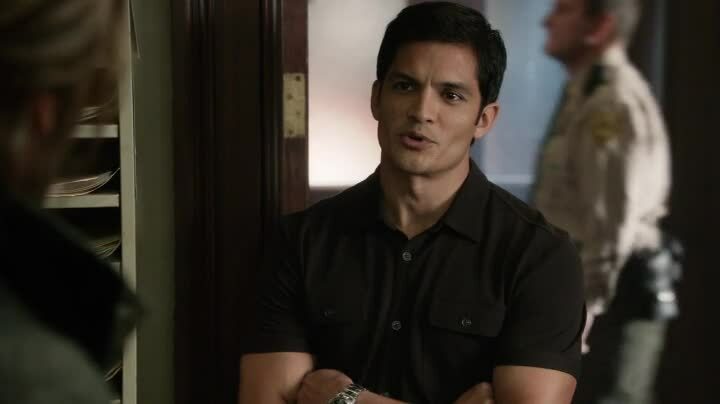 The best part of the episode is when Andy Dunn’s body comes back to life, complete with Pez John Cho head! I totally did not expect John Cho to be beyond the pilot, yet here he is. He fixes his head (though still has loose skin on his neck) and Blurry Demon From Legend yells at him in Huttese to go resurrect some witch. Also he pukes up a necklace to help with that. Ichabod becomes a big fan of donuts, then starts a donut tax outrage that Abbie just shuts down. Is this tea party tax complaint founding father’s thing a message? Or is the fact a black female tells him to stop being an idiot (and he does) the real message? Dead for 250 years, but still has killer reflexes! 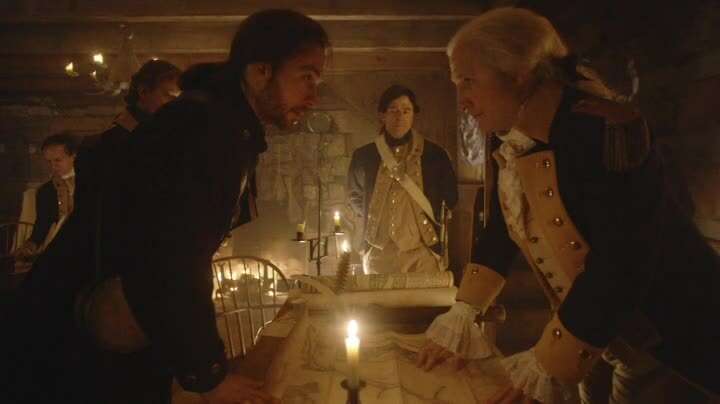 Look, Ichabod, we’re going to win this war because I need my face on money, dammit! We all know witches are burned, thus the witch Andy raises is all black and looks like she’s covered in tar. She’s Serilda of Abadon! Remember the name, I copied it from the credits. She kills a dude after Andy pulls him over (and tells him he’s sorry) and rips out some of his burnt organs. Ichabod and Abbie are at the scene, and Ichabod instantly recognizes the method of death as the same way dozens of Colonial troops were killed when the English allied with a coven of evil witches during the Revolutionary War. Shoutout to the Indian guy seen during the flashback. That does not stop Ichabod, who is in need of coin as he is broke. 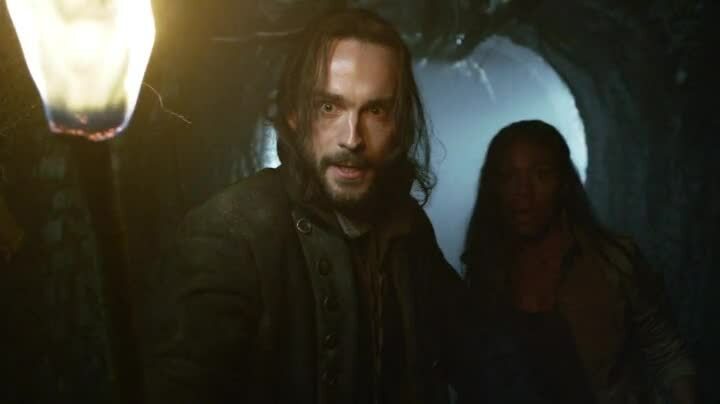 Ichabod does know about secret tunnels under the city that were built for smuggling weapons during the war and then never used ever again, despite only barely being sealed off and well-lit. The tunnels are full of old gunpowder from the Revolutionary War, and also the bones of witches as no one wanted to give them a proper burial. I’m sure neither of those facts will come in handy during the finale. They find Sheriff Corbin’s files, and through that learn the Sisterhood of the Radiant Arc – a group of good witches – used their powers to make Serilda weak so she could be captured. And Katrina was one of the good witches. And Serilda vowed revenge on the descendents of the people who put her on trial for witchcraft as she burned. 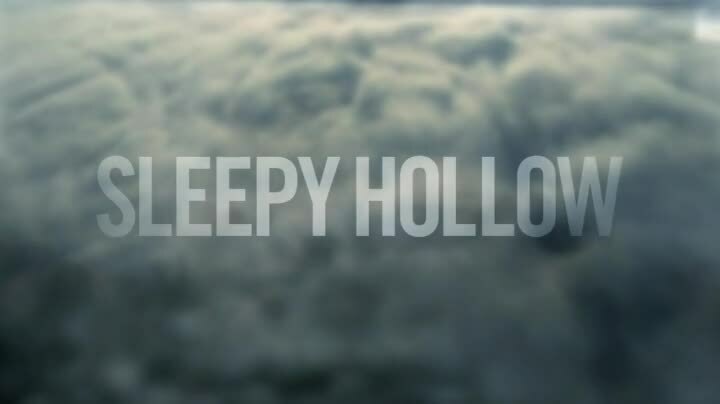 Hey, Sleepy Hollow just became like a dozen movies! Including El Baron Del Terror. In fact, let’s just go 100% El Baron Del Terror, because that movie rules! Serilda resurrects herself in the secret tunnels! A neat effect is her lying her bones down, and then lying on the bones and them entering her burnt body. She’s now 100% whole and 100% hot. 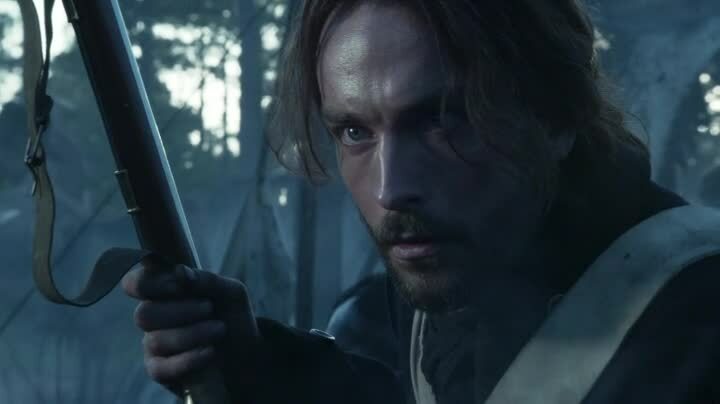 Abbie gives Ichabod a gun, and he fires one shot (which Serilda catches) and then drops the gun. Abbie grabs it and complains, Ichabod not realizing the gun has more than one shot. Of course, it doesn’t matter. 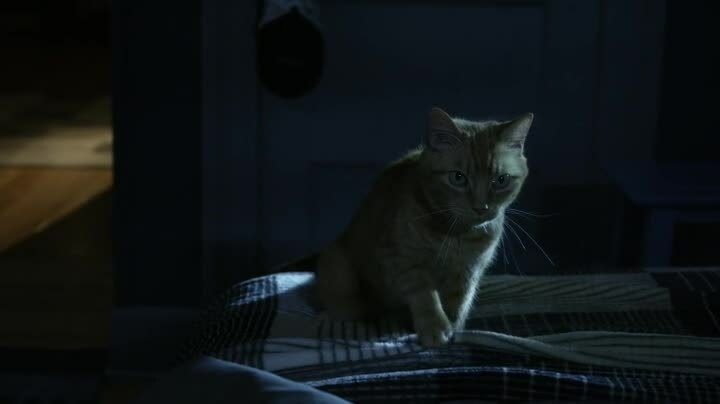 I demand three episodes about this awesome cat. She rules! Just waiting for a time traveling cyborg to bust me out of here! Andy is also lurking around, but besides looking creepy, he doesn’t do anything and stays out of sight for the rest of the episode. Probably hanging with Orlando Jones. Hey, remember that old gunpowder? Well, it gets blown up along with Serilda! Score one for Chekhov’s gun! 49 is the room number where Abbie’s sister Jenny (Lyndie Greenwood) lives in the mental hospital. She’s 100% Sarah Conner in Terminator 2, complete with spitting out the pill and doing nonstop workouts. Kurtzman and Orci, are you serious? Not that I’m complaining, a character like this will be awesome. But seriously? You owe James Cameron and William Wisher Jr. a bag of money for this scene. “Blood Moon” was a cool followup, setting the tone for the regular episodes in having weird crap without needing the Headless Horseman showing up all the time. Several side characters who will be important are introduced, John Cho and Clancy Brown return in various after-death forms, and characters begin to flesh out back stories. 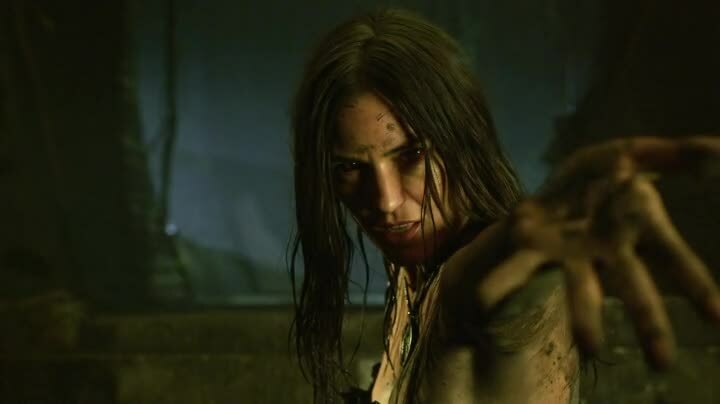 Important information for the series is the mention that no one knows where Katrina’s body is buried, and that the fact that she’s trapped between worlds means she might be able to be rescued. Ichabod mentions he has a photographic memory, which confirms that they’re trying to make him basically Sherlock Holmes. That can be good as long as they don’t directly reference Holmes, ever. 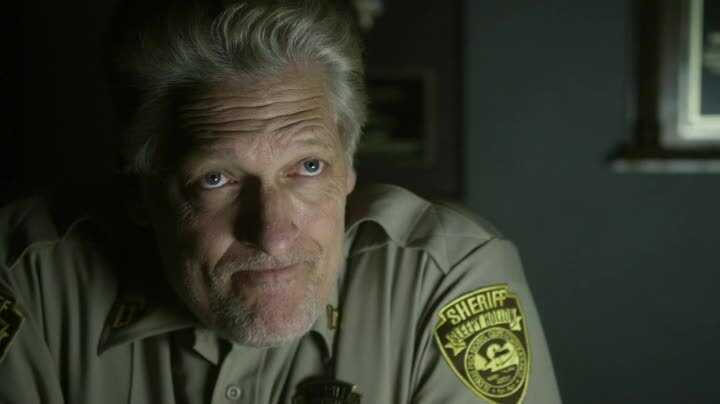 Annoyances: Will every episode feature Ichabod knowing 80% of the answer and Sheriff Corbin’s files having the other 20%? Because that’s going to get old real fast. We need some thing neither know how to deal with. Also put Orlando Jones in more of the show! Since we’re just outright lifting characters from other media for this show, what character should they take next? Perhaps Elvis should join the battle between good and evil. Everyone loves Elvis! Cut! Who let the Headless Horseman be the camera guy?? Sleepy Hollow? I ain’t getting any sleep! No, please, I don’t want to be in JJ Abrams’ Legend! All these burned bodies means I can’t loot the dead! Hi, I’m an important character making a brief introduction so I don’t come out of left field next week! Where did they get the torches from? Sure this show will kill off all the guest stars, but they’ll be back next week!